When you no longer need a Calendar group, you can delete it. You must have administrator permissions to delete a group. Caution: Deleting a Calendar group permanently deletes files and information associated with the group, such as events, resources, and files. 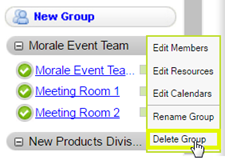 In the left pane, under the New Group button, click the white arrow for the calendar group you want to delete. From the list that appears, click Delete Group.